The board of Food Standards Scotland (FSS) will today consider reductions in the promotion, advertising and portion size of certain foods and drinks, and the use of taxation and regulation to improve the Scottish diet. 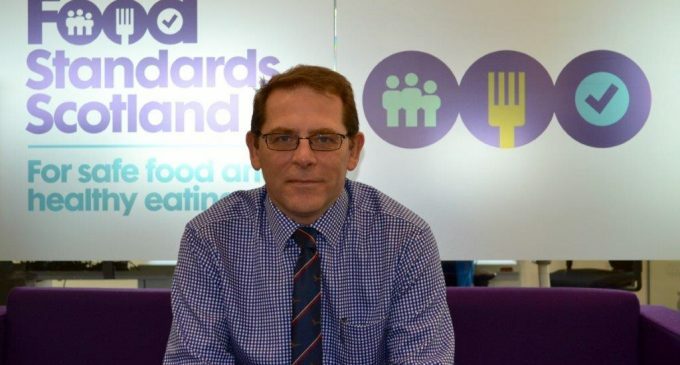 Geoff Ogle, Chief Executive of FSS (pictured), said: ‘We have been evaluating and considering a wide range of measures to help improve the Scottish diet and we’re now in a position to take our recommendations to our board for them to decide what should be recommended to the Scottish Government. ‘We’re aware there is no single silver bullet solution to reducing our obesity problem, and indeed these problems are not solely diet-related, as exercise and being more active plays a vital role too. ‘However, we do believe that the measures we are proposing are vital pieces of the jigsaw. We have been missing the Scottish Dietary Goals for the last 15 years, despite all the good work that’s been done, so we believe that radical change is needed. In addition to the Board paper, FSS are today publishing the FSS report: Monitoring foods and drinks purchased into home in Scotland, using retail data from Kantar World Panel, which confirms a lack of progress in Scotland. Despite reductions in the purchase of soft drinks containing sugar, down by 21% since 2010, total sugar purchasing has not changed. The report also provides evidence on food and drink shopping trends in Scotland over the past five years, and confirms the large quantities of discretionary foods such as sweets, chocolate, crisps, savoury snacks, biscuits, cakes, pastries and sugary drinks being consumed by consumers in Scotland.